Cryptocurrencies have become increasingly popular over the past several years - as of 2018, there were more than 1,600 of them! And the number is constantly growing. With that has come an increase in demand for developers of blockchain (the underlying technology of cryptocurrencies such as bitcoin). The salaries blockchain developers earn show how much they are valued: According to Indeed, the average salary of a full stack developer is more than $112,000. There’s even a dedicated website for cryptocurrency jobs. Whether you’re interested in a career as a blockchain developer or you just want to keep up with the latest trends in tech, Simplilearn’s Cryptocurrency Explained video explains what cryptocurrency is and why it’s important will get you off to a good start. Here we’ll recap what’s covered in the video. People’s requirements have to coincide—if you have something to trade, someone else has to want it, and you have to want what the other person is offering. There’s no common measure of value—you have to decide how many of your items you are willing to trade for other items, and not all items can be divided. For example, you cannot divide a live animal into smaller units. The goods cannot be transported easily, unlike our modern currency, which fits in a wallet or is stored in a mobile phone. After people realized the barter system didn’t work very well, currency went through a few iterations: In 110 B.C., an official currency was minted; in A.D. 1250, gold-plated florins were introduced and used across Europe; and from 1600 to 1900, paper currency gained widespread popularity and ended up being used around the world. This is how modern currency as we know it came into existence. Modern currency includes paper currency, coins, credit cards and digital wallets—for example, Apple Pay, Amazon Pay, Paytm, PayPal and so on. All of it is controlled by banks and governments, meaning that there is a centralized regulatory authority that limits how paper currency and credit cards work. Decipher the global craze surrounding Bitcoin and Cryptocurrencies with the Blockchain Certification Course! Click here for the course preview! The financial institution could have a technical issue, such as its systems are down or the machines aren’t working properly. Your or your friend’s account could have been hacked—for example, there could be a denial-of-service attack or identity theft. The transfer limits for your or your friend’s account could have been exceeded. There is a central point of failure: the bank. This is why the future of currency lies with cryptocurrency. Now imagine a similar transaction between two people using the bitcoin app. A notification appears asking whether the person is sure he or she is ready to transfer bitcoins. If yes, processing takes place: The system authenticates the user’s identity, checks whether the user has the required balance to make that transaction, and so on. After that’s done, the payment is transferred and the money lands in the receiver’s account. All of this happens in a matter of minutes. Cryptocurrency, then, removes all the problems of modern banking: There are no limits to the funds you can transfer, your accounts cannot be hacked, and there is no central point of failure. As mentioned above, as of 2018 there are more than 1,600 cryptocurrencies available; some popular ones are Bitcoin, Litecoin, Ethereum and Zcash. And a new cryptocurrency crops up every single day. Considering how much growth they’re experiencing at the moment, there’s a good chance that there are plenty more to come! 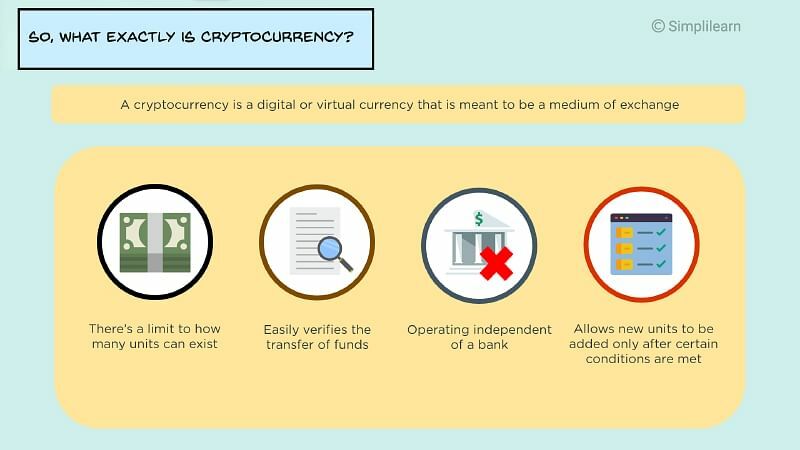 A cryptocurrency is a digital or virtual currency that is meant to be a medium of exchange. It is quite similar to real-world currency, except it does not have any physical embodiment, and it uses cryptography to work. Because cryptocurrencies operate independently and in a decentralized manner, without a bank or a central authority, new units can be added only after certain conditions are met. For example, with Bitcoin, only after a block has been added to the blockchain will the miner be rewarded with bitcoins, and this is the only way new bitcoins can be generated. The limit for bitcoins is 21 million; after this, no more bitcoins will be produced. With cryptocurrency, the transaction cost is low to nothing at all—unlike, for example, the fee for transferring money from a digital wallet to a bank account. You can make transactions at any time of the day or night, and there are no limits on purchases and withdrawals. 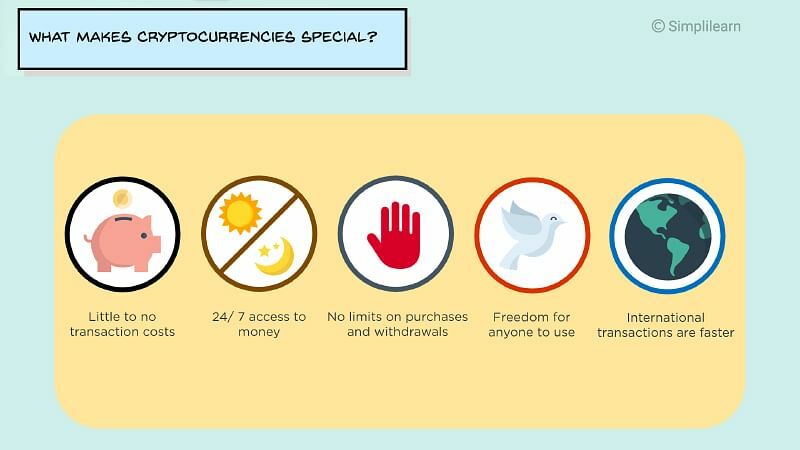 And anyone is free to use cryptocurrency, unlike setting up a bank account, which requires documentation and other paperwork. International cryptocurrency transactions are faster than wire transfers too. Wire transfers take about half a day for the money to be moved from one place to another. With cryptocurrencies, transactions take only a matter of minutes or even seconds. Cryptography is a method of using encryption and decryption to secure communication in the presence of third parties with ill intent—that is, third parties who want to steal your data or eavesdrop on your conversation. Cryptography uses computational algorithms such as SHA-256, which is the hashing algorithm that Bitcoin uses; a public key, which is like a digital identity of the user shared with everyone; and a private key, which is a digital signature of the user that is kept hidden. In a normal bitcoin transaction, first, there are the transaction details: whom you want to send the bitcoins to and how many bitcoins you want to send. Then the information is passed through a hashing algorithm. Bitcoin, as mentioned, uses the SHA-256 algorithm. The output is then passed through a signature algorithm with the user’s private key, used to uniquely identify the user. The digitally signed output is then distributed across the network for other users to verify. This is done by using the sender’s public key. The users who check the transaction to see whether it’s valid or not are known as miners. After this is done, the transaction and several others are added to the blockchain, where the details cannot be changed. 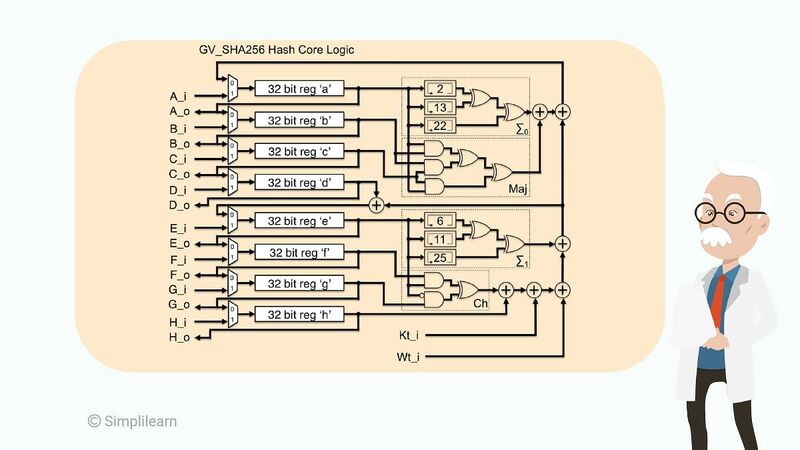 The SHA-256 algorithm looks something like in the image below. You can see how complicated it is, meaning it’s safe to say that the encryption is very difficult to hack. You now know that Bitcoin is a digital currency that is decentralized and works on the blockchain technology and that it uses a peer-to-peer network to perform transactions. Ether is another popular digital currency, and it’s accepted in the Ethereum network. The Ethereum network uses blockchain technology to create an open-source platform for building and deploying decentralized applications. Bitcoin and ether are the biggest and most valuable cryptocurrencies right now. Both of them use blockchain technology, in which transactions are added to a container called a block, and a chain of blocks is created in which data cannot be altered. For both, currency is mined using a method called proof of work, involving a mathematical puzzle that needs to be solved before a block can be added to the blockchain. Finally, both bitcoin and ether are widely used around the world. Enroll today for the Blockchain Certification Training and learn to work with Hyperledger projects! Bitcoin is used to send money to someone. The way it works is very similar to the way real-life currency works. Ether is used as a currency within the Ethereum network, although it can be used for real-life transactions as well. Bitcoin transactions are done manually, which means you have to personally perform these transactions when you want them done. With ether, you have the option to make transactions manual or automatic—they are programmable, which means the transactions take place when certain conditions have been met. As for timing, it takes about 10 minutes to perform a bitcoin transaction—this is the time it takes for a block to be added to the blockchain. With ether, it takes about 20 seconds to do a transaction. There is a limit to how many bitcoins can exist: 21 million. This number is supposed to be reached by the year 2140. Ether is expected to be around for a while and is not to exceed 100 million units. Bitcoin is used for transactions involving goods and services, and ether uses blockchain technology to create a ledger to trigger a transaction when a certain condition is met. Finally, Bitcoin uses the SHA-256 algorithm, and Ethereum uses the ethash algorithm. As of April 2019, 1 bitcoin equals $5029.18 dollars and 1 ether equals $164.38. The world is clearly divided when it comes to cryptocurrencies. On one side are supporters such as Bill Gates, Al Gore and Richard Branson, who say that cryptocurrencies are better than regular currencies. On the other side are people such as Warren Buffet, Paul Krugman and Robert Shiller, who are against it. Krugman and Shiller, who are both Nobel Prize winners in the field of economics, call it a Ponzi scheme and a means for criminal activities. In the future, there’s going to be a conflict between regulation and anonymity. Since several cryptocurrencies have been linked with terrorist attacks, governments would want to regulate how cryptocurrencies work. On the other hand, the main emphasis of cryptocurrencies is to ensure that users remain anonymous. Futurists believe that by the year 2030, cryptocurrencies will occupy 25 percent of national currencies, which means a significant chunk of the world would start believing in cryptocurrency as a mode of transaction. It’s going to be increasingly accepted by merchants and customers, and it will continue to have a volatile nature, which means prices will continue to fluctuate, as they have been doing for the past few years. That wraps up our cryptocurrency tutorial. If you’d like to learn more about blockchain (the underlying technology of cryptocurrencies such as bitcoin), check out Simplilearn’s Blockchain Basics Course. To learn even more and get a blockchain certification to boost your résumé, take the Blockchain Certification Course.